W. W. Norton & Company, 9780393088809, 54pp. Launched on July 1, 1916, the Battle of the Somme has come to epitomize the madness of the First World War. Almost 20,000 British soldiers were killed and another 40,000 were wounded that first day, and there were more than one million casualties by the time the offensive halted. In The Great War, acclaimed cartoon journalist Joe Sacco depicts the events of that day in an extraordinary, 24-foot- long panorama: from General Douglas Haig and the massive artillery positions behind the trench lines to the legions of soldiers going "over the top" and getting cut down in no-man's-land, to the tens of thousands of wounded soldiers retreating and the dead being buried en masse. 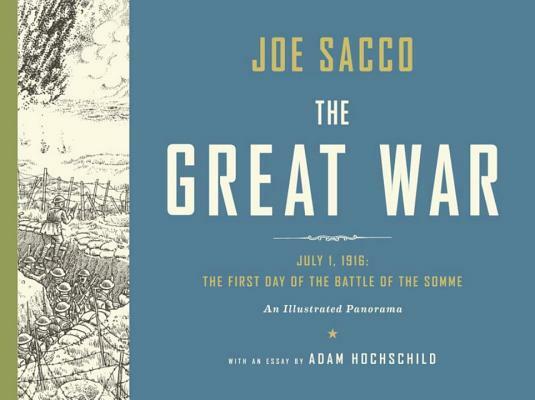 Printed on fine accordion-fold paper and packaged in a deluxe slipcase with a 16-page booklet, The Great War is a landmark in Sacco's illustrious career and allows us to see the War to End All Wars as we've never seen it before.